In honor of the Boston-Golden State mega-matchup on Saturday night, it begs the question: Why don't other teams get creative when hiring their head coaches? Brad Stevens did a fabulous job at Butler, but he had zero NBA experience when Danny Ainge put him in charge of the NBA's most storied franchise. That has proven to be a grand-slam hire. Stevens became the Celtics' first coach with no NBA experience of any kind since Alvin "Doggie" Julian gave way to franchise icon Red Auerbach in 1950. One year after the Stevens hire, the Warriors pushed aside successful coach Mark Jackson and hired Steve Kerr. He had plenty of NBA playing experience and spent three seasons as general manager of the Phoenix Suns before stepping down in June 2010 but zero coaching experience. If Stevens was a grand-slam hire, Kerr has been a perfect game if we must stick with baseball references. More and more NFL teams are trying to find the next Sean McVay. Perhaps NBA teams will now think outside the box instead of recycling the Dave Joergers and Frank Vogels and Jeff Hornaceks and Michael Malones and Stan Van Gundys and Scott Brookses of the world. Yes, the NBA is a player league first and foremost, but coaching/keeping egos in check matters. A 5 p.m. ET start from Motown. Oklahoma City at least got creative when replacing Brooks by hiring two-time national champion Billy Donovan from Florida. The Thunder won their sixth in a row Thursday, 121-112 over Washington. Russell Westbrook mistakenly thought he was picked last in Thursday's All-Star draft (he found after he wasn't) and took out his frustrations on John Wall with a season-high 46 points. The Pistons lost their sixth in a row Wednesday, 98-95 in overtime, blowing a late nine-point lead in regulation. Andre Drummond had 30 points and 24 rebounds. How much longer until Van Gundy is fired? Detroit won in OKC on Nov. 24, 99-98. Westbrook had a chance to win the game with 2.7 seconds left, but his pull-up 3-pointer missed. Why are you taking a pull-up 3-pointer down one? Westbrook finished with 27 points, 11 rebounds and 11 assists. Drummond led Detroit with 17 points and 14 rebounds. Key trends: The home team is 5-1 against the spread in the past six meetings. The "over/under" has gone under in the past seven. Early lean: Thunder and under. Here are two retread coaches in Orlando's Vogel - who might not be long for that job and goes against his former team - and Indiana's Nate McMillan. The Pacers were in Cleveland on Friday (again without Myles Turner) so this could be a letdown game, assuming teams still get up for facing the Cavaliers. The Magic lost at home to the Kings on Tuesday, 105-99. Orlando was outscored 28-17 in the fourth by a team on an eight-game losing streak. Orlando is 0-2 vs. Indiana this season and has dropped 17 of the last 19 regular-season meetings. Key trends: The Magic are 1-7 ATS in their past eight at Indiana. The over is 10-1 in Orlando's past 11 on Saturday. Early lean: Magic and over. Atlanta was in Charlotte on Friday. Washington lost for the fourth time in five games Thursday, 121-112 in Oklahoma City. Bradley Beal scored 41 points and had an unusual 12 rebounds, and John Wall had 21 points and 12 assists, but the Wizards coughed it up 23 times. This team is imploding. These teams have split two meetings, each winning at home by double digits and scoring 113 points in doing so. Key trends: The home team is 6-2 ATS in the past eight meetings. The under has hit in five straight Hawks home games. Charlotte hosted Atlanta on Friday. The Heat dropped their second straight Thursday, upset 89-88 at home by Sacramento on a last-second dunk be De'Aaron Fox. Miami blew a 12-point lead in the fourth. Goran Dragic returned from a two-game injury absence and had 22 points but was the only Heat starter in double figures. In fact, the other four guys combined for just 20. Miami has won all three meetings this season but by a combined 12 points. It was 106-105 last Saturday in Charlotte. Kelly Olynyk scored 14 of his 16 points in the fourth quarter, including a free throw with 0.2 seconds left following a questionable foul call on Dwight Howard. Key trends: The Hornets are 0-5 ATS in the past five meetings. The under is 9-3 in the previous 12. ABC national telecast and looking more and more like a Finals preview unless the Cavs get their act together in the East. These should be the top two seeds entering the postseason. Boston ended a four-game skid with a 113-102 win at the Clippers on Wednesday. Kyrie Irving had 20 points, eight rebounds and seven assists. Al Horford and Marcus Smart were both out. Horford banged his head Tuesday, but the team says he doesn't have a concussion and it was just precautionary. Smart cut his hand on some glass. Why does that sound fishy? 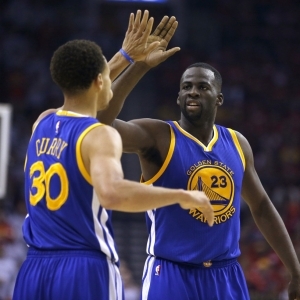 Golden State beat the visiting Timberwolves on Thursday, 126-113. Kevin Durant had 28 points, 11 assists and 10 rebounds, and the Dubs hit a season-high 21 3-pointers. On Nov. 16, the Celtics beat the Warriors 92-88 - that was in the midst of Boston's 16-game winning streak. Irving had 11 of his 16 points in the fourth quarter, including two free throws that put his team ahead in the closing seconds. Golden State led by as much as 17. Steph Curry was just 3-for-17 shooting for nine points. Believe it or not, the Celtics have won their past two in Oakland as well. Key trends: The Celtics are 4-10 ATS in their past 14 after a win. The over is 5-0 in the Warriors' past five at home. Early lean: Wait on Horford/Smart, but this feels like a Warriors blowout as they will not allow themselves to be swept. Brooklyn was in Milwaukee on Friday. Minnesota is now 2-2 without Jimmy Butler (sore knee, questionable) as it lost 126-113 at Golden State on Thursday. Karl-Anthony Towns led Minnesota with 31 points and 11 rebounds, but his team was outscored a whopping 48-15 on the break. The Nets upset the visiting Timberwolves 98-87 on Jan. 3. Spencer Dinwiddie made the go-ahead jumper with 10.1 seconds left and finished with 21 points. Butler missed his shot at the buzzer but had 30 points. Key trends: The home team has covered four straight in the series. The over is 4-1 in Minnesota's past four at home. Early lean: Wait on Butler. Dallas hosted Portland on Friday. Denver won a second straight, both at home, on Thursday, 130-118 over the Knicks. Gary Harris scored 23 points, and Trey Lyles had 21 in the Nuggets' 10th straight home win in the series. Denver hit 14 of 28 3-pointers and shot 60 percent overall. These teams have split two meetings, each winning at home. Denver has won the past three in the series at the Pepsi Center. Key trends: The home team has covered 10 of the past 15 meetings. The under is 7-1 in Denver's past eight. How about $60 worth of member's picks absolutely free? No obligation, no sales people, no credit card. You can use you $60 credit on any of our top NBA handicappers. Get $60 worth of premium members' picks free! Also, for a limited time only get three top NBA handicappers for the price of one! Click Here . Get free NBA basketball picks today at Doc's Sports basketball predictions page .